Hey Gang. I don't really know what I'm doing, but thought I'd give it a whirl. 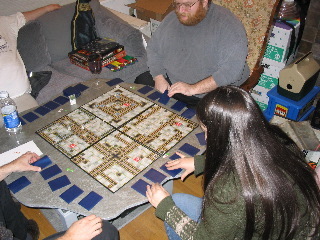 This was the first game night held at Dave Howell and Eric Yarnell's new house. All agreed that it held the numbers well, and will be even better once their remodel is finished. I don't have the list of who attended (or last names for those of you I don't know very well - please forgive!) so please fill in if you get a chance. I'm going by the score sheets I collected that night. In Attendance: Dave_Howell? and Eric_Yarnell,_ND?, John_Braley?, Meryl_Douglas?, Nat_Dupree?, Steve_Dupree?, Meredith_Hale?, Marty_Hale-Evans?, Ron_Hale-Evans?, John_Reiher?, Ben_Sklar?, Alex_Swavely?, ChadUrsoMcDaniel, Bob_Kaldor?, Josh_Kaldor?, Nate_Kaldor?, Patrick_Clarke?, and his SO Chris; also James, Kiera, Kendra, Will, and Mark (those are all the names I found on the score sheets...). David_Adams? and Kathy_Kizer? stopped in as well with Dave's kids to check out the location for next time. A mess o' game night snacks in Dave & Eric's kitchen. Mirror, Mirror, on the wall / Am I short or am I tall? 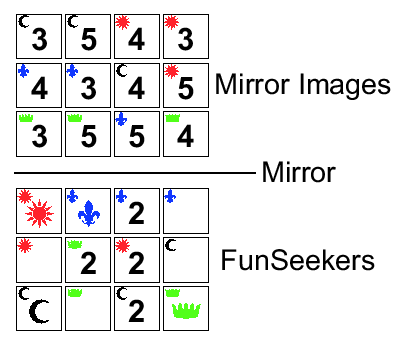 There are no photos from these sessions at my request (games had to be entered in the contest anonymously), so I've included a graphic from the EF rules showing the Magic Mirror room, drawn up by AlphaTim. Marty played other games most of the evening, but returned for a post mortem with me and the playtesters. Time: 5:45 p.m. - 7:30 p.m.
Any comments from the players? I personally had a great time playing this game. I've only played it a few times, and had a rocky start with some bad planning, but it's the first time I didn't lose completely. Yes, I lost, but I wasn't last. I also felt like I learned a few things for next time, which is always good. Prize: Prizes? We don't need no steenkin' prizes! For this being Mark's first time playing the game, he picked up not only the rules, but a winning strategy rather quick..
Time: 9:30 p.m. - 11:00 p.m.
"THIS is where the fresh fish should go, you morons." Nate caught on quick, getting three of his shops very close to their suppliers. But he really got shafted on the fourth, with the road meandering around the board before it got to his nuclear plant. I bided my time and bid very low on the shops, hoping to make up for it with the negative points my coins would provide later. My strategy worked since Natalie and I had the same distance to our shops, but I won because I had one more coin than she did. The scores reflect the fact that Nat and I have played a number of times before, and Patrick, Chris, and Nate were newbies hindered by my poor explanation. Watch out for them in the next game! Time: 9:50 p.m. - 10:46 p.m.
1. One Million BCE: The origin of Man, helpfully highlighted by Mr. Hands. 2. 900,000 BCE: Man's hunting grounds have expanded. 3. 750,000 BCE: Man's dominion now extends nearly as far as the doorknob. Eric knows how I play, and he doesn't let me get away with much. 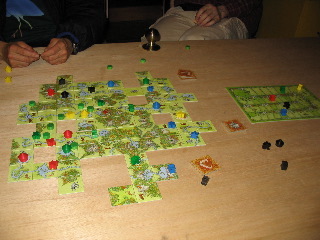 Hunters and Gatherers is, I think, better than regular Carcassonne for beginners, since the scoring is much less arcane than the farmer/field system of regular Carcassone. Also, it's more balanced. 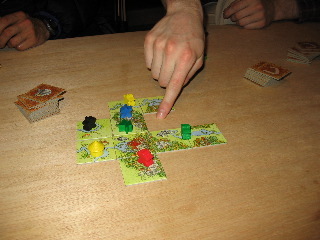 I think you can win H&G without "hunting" a big field, whereas it's almost impossible to win standard Carcassonne if you ignore farming. 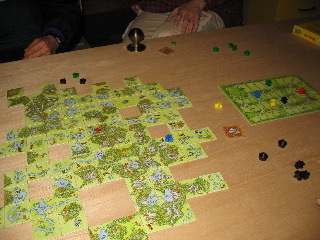 Nevertheless, they're related, and I managed yet another Carcassonne win in this game by staying on top of fields. Don't feel bad, Alex -- it's the economy. We played a quick game of Grondor to finish the night out. Did you then trudge into Mrordor, throw the Rring into Mrount Droom, and return home to the Shrire to live hrappily ever after? Seven of us sat down to play our freshly-constructed copy of Zombie Plague. In place of player tokens, we used the zombies and shotgun dudes from Zombie!, which worked pretty well for the most part. In addition, I also created reproductions of the various Search squares in Photoshop to use as an aid in remembering who has searched which square (each player can only search each square once). The humans had truly terrible luck with their initial searches! The first few resulted in humans with ammo but no weapons, extra zombies, zombies with extra Action Points, and a fairly useless (at that point) barricade. There was plenty of ineffectual flailing at each other by both humans and zombies. Both sides suffered from severely bad dice for quite some time, although truth be told, it really IS hard to kill a zombie with your bare hands! The humans had split up to try to get more weapons, but a few bad breaks for them, coupled with lucky zombie reinforcement rolls resulted in zombies guarding most of the search squares, and eventually driving the one human in the house out toward the car/garage area! One did finally find the shotgun, and then immediately ran out of ammunition! We also found out that baseball just wasn't his game - when he tried to use the shotgun as a baseball bat (which increased his odds of killing a zombie twelve-fold from hand-to-hand), he rolled several "OOPS!" in a row, stunning himself each time. The zombies wounded humans several times and eventually managed to zombify their first human (Natalie), who had gone to anothers aid as she tried to get past the zombies guarding the car trunk. Unfortunately for her, she only found another Zombie in the car trunk, and was then boxed in by another "fresh" zombie and had to try to fight her way out past her ex-teammates! Despite dire threats referring to the merits of sleeping on the couch, her brain was munched (Steve: "mmmmm.... brains..."), and a 3rd would-be rescuer (Nate?) got 'et as well, leaving only a hapless solo human (Mark, I believe) tripping over his ammo-less shotgun! The zombies were slow, but they eventually ate him as well, despite a valiant flourish of baseball bat swings (three strikes - you're out! ), resulting in a clean sweep for the Zombies! Having only played once before, I'm no expert, but it seemed this was a very unusual game. The humans really had horrendous luck with their initial search cards, no good luck at all when they really needed it (it's HARD to fight zombies barehanded! ), and the zombies were consistently lucky when placing fresh undead. An early weapon or two, and it could easily have been a VERY different game. I doubt the zombies are often able to "defend" search squares! Regardless of the slow and sloppy combat, everyone seemed to have a good time. Plenty of in-character chatter and zombie sounds. I do think this game benefits from having a good number of people, although it became impossible to tell which zombie was whose, once well into the game (16 on the board plus a couple "bonus" corpses). Next time, we'll color code the zombies or something! The one other thought I had was that the rules regarding zombification seem kind of "brittle". A zombie attack has a one in six chance of wounding, and then a one in six chance of the wound resulting in zombification. It's pretty much all or nothing. Chris (a zombie teammate!) and I were tossing about some ideas to maybe make it less all or nothing. Perhaps using Action Points similar to good old Hit Points might be interesting, maybe giving the humans one more to compensate. This might add a little more tension as humans slow down as they get wounded. FWIW, after our first (previously played) game - 2 humans, 2 zombies - the game seemed a little slanted towards humans. One human with a chainsaw handily wrapped that game up pretty quick. After this game, I'm not so sure - guess we'll have to play some more to get a better idea! Did anyone get a picture of the game in progress? I thought so, but I could be mistaken. You can find more or less the same session report by Patrick over on BoardgameGeek, but with plenty of analysis and rules clarifications from BGG regulars. 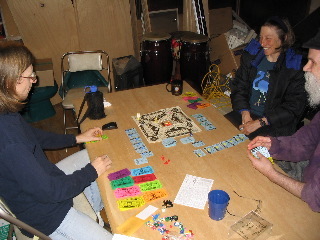 The game board before the players departed Parts Unknown for parts unknown. This game started out with Mark_Haggerty?, Dave_Howell?, Meryl_Douglas?, John_Braley?, and Eric_Yarnell,_ND?. I have long wanted to play this using Dave's special stiffened board. So finally my time had come. We got things set up, and right away Dave and Mark were distracted by something else. This forced me to read the rules and try to figure it out, when Dave should have been doing a better explaining job. We waited a long time for Dave to come back, and then Mark, and realized neither one was, and so started without them. 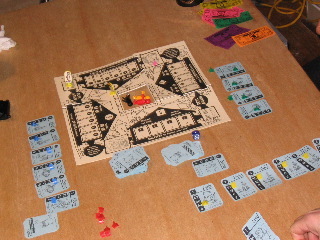 A couple of lucky dice rolls in the mechanical portion of the track gained me a pile of money fairly early, and my lead was never overtaken. I was irritated at Dave and Mark for bailing without clearly saying they were bailing, after I had spent a lot of energy roping them in. Oh well, I'm over it now, especially because I won. It did seem to go on for a really long time. The strategy in this game is daunting. I don't think anyone hardly ever used their parts unknown power--it just didn't seem useful. I believe the game was called due to lateness, and the fact that Parts Unknown always takes longer than you think it will. Looks from the photo as though John_Braley?, Meryl_Douglas?, and Eric_Yarnell,_ND? were playing as well as (presumably) you, Dave. Thanks to Meredith_Hale? and the rest of the Seattle Cosmic crew for putting this newsletter together. Thanks to Patrick_Clarke? for the great analysis of the Zombie_Plague? game. Dave_Howell? did the photos this time; thanks, Dave! Ron_Hale-Evans? 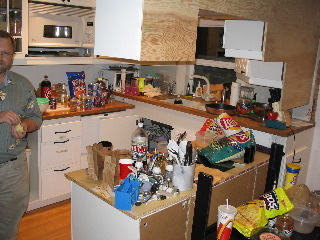 did general cleanup and most of the photo captions. 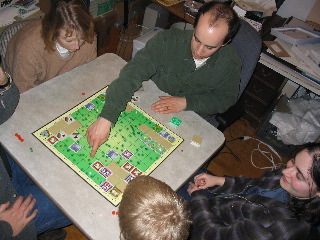 [[SeattleCosmicGameNight20031206? ]]: Saturday, 5:00 PM at the house of David_Adams? and Kathy_Kizer? in Tukwila. Come play for fun and FABULOUS PRIZES from the PrizeBag! GamesToTheRescue is a philanthropic project of the Center for Ludic Synergy and Seattle Cosmic Game Night. The aim of the project is to provide game equipment and a book of game rules to hospitals, for use by patients and visitors. You can support GamesToTheRescue by buying games via our Funagain affiliate program, buying Seattle Cosmic Gear, and in a number of other ways. See the GamesToTheRescue page for more details.